Most newborn deaths from infection could be prevented by ensuring that all babies receive essential newborn care (ENC), including appropriate cord care, early initiation and exclusive breastfeeding, maintenance of warmth, and prompt treatment with antibiotics. Hygienic practices such as clean delivery and handwashing are also known to reduce newborn infections. Application of 7.1% chlorhexidine on the umbilical cord stump (compared to the previous practice of keeping the cord clean and dry) has also proved to reduce newborn mortality. Together with identification of infection and antibiotic treatment, chlorhexidine application would save hundreds of thousands of newborns annually. Early initiation of breastfeeding, within an hour after birth, would further reduce newborn deaths—partly as a result of prevention of newborn infection through the provision of antibodies to assist the baby fight infection. Exclusive breastfeeding also reduces a baby’s risk of getting an infection from unhygienic food substitutes. Studies have shown that both the preventative and curative (antibiotic treatment) interventions could be safely and effectively delivered through facility- and home-based mechanisms. In addition, based on studies that showed positive outcomes from early postnatal home visits by a trained person, WHO and UNICEF issued a joint statement recommending postnatal home visits on Day 1 and 3 after birth for all newborn infants. MCHIP’s Newborn Team supported both preventative and curative interventions for addressing newborn deaths due to infections. However, the primary focus was on the preventative interventions and the recognition and referral of newborn infants with danger signs (including those for infection). In Bangladesh, ENC was integrated in the Helping Babies Breathe (HBB) training for all skilled birth attendants, ensuring that they had the knowledge and skills to counsel and coach mothers who they deliver on ENC practices to prevent their newborn from acquiring infections. In addition to the training of service providers, MCHIP provided support to the Ministry of Health and its implementing partners to train and equip community health workers (CHWs) to conduct postnatal home visits to counsel and support mothers and families to practice ENC (including the identification of danger signs for newborn infection and seeking prompt care at the health facility). MCHIP also revised the country’s community-based maternal and newborn health package developed under the ACCESS\Bangladesh Project, which was used to train project recruited Community Health Workers (CHWs) on counseling and coaching for various maternal and newborn health issues, including ENC. The CHWs were equipped with counseling materials, including flipcharts and dolls, for demonstrating key ENC practices. Their tasks included identification of all pregnant women in their assigned catchment areas, home visits to the identified women twice during pregnancy and three times after delivery (within 24 hrs, on day 3, and between days 7-14 post-delivery) per Ministry of Health (MOH) policy. Under MaMoni, the strategy was transitioned to train paid government CHWs (including Family Welfare Assistants [FWA] and Female Health Assistants [FHA]) to undertake the postnatal care home visits. MaMoni also transitioned from Sylhet district to Habiganj district. In Habiganj, MaMoni1 continued to recruit a small number of project-paid CHWs to cover areas with FWA and FHA vacancies, making the intervention accessible to most mothers and their newborns and improving equity. In Paraguay and the Dominican Republic, MCHIP assisted in quality improvement efforts to manage newborn sepsis in facilities. As a result, in the Dominican Republic, improvement was seen in ENC at birth and in reducing hospital-acquired infections. Results in Bangladesh were based on Health Management Information System data from the Habiganj Ministry of Health district office. MCHIP provided technical support to streamline the data collection, analysis and utilization. The data was used for microplanning at the community and union levels to, among other things, identify pregnant women, mothers and newborn who had not been visited at home by the CHWs. 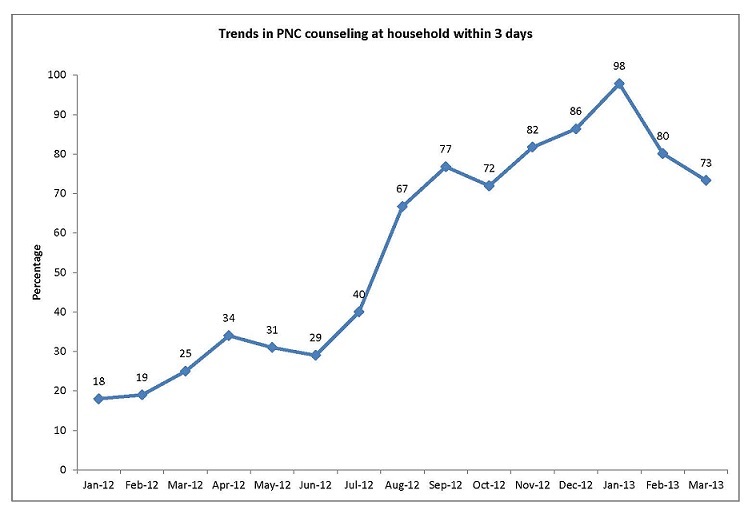 As shown in this graph, postnatal care home visits increased from below 20% to 98% over a 13 month period. 1 The MaMoni project was a USAID associate award to the MCHIP Program, and was implemented by Save the Children and two local nongovernmental organizations (Shimantik and FIVDB). It was an integrated safe motherhood, newborn care, and family planning project.